Show us a discontinued food or product you wish would return. Understand, I don't drink or even like coffee. And I never drank coffee substitutes: why would I drink a substitute for something I don't like? But She Who Must Be Obeyed really liked Postum. A lot of other people liked the stuff, too… including a bunch of Mormons (they aren't supposed to take caffeine). The product's origin is not, however, related to Mormonism. It was developed in 1895 by Charles William Post, a Seventh-day Adventist who felt that caffeine was a bad thing. So the Seventh-Day Adventists are left hanging as well. In our case She discovered it was missing when we visited a local store to buy more of the stuff. We couldn't find it and the store manager delivered the bad news that, as of late last year, it was no longer being manufactured. Now Postum lovers are left looking at other coffee substitutes and, I guess, many of those products are, well, drek! So rest in peace, oh long-lived cereal beverage; you are missed. Yeah, they're taking away loads of good stuff. Never tried Postum… would have liked to though. 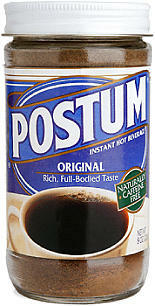 I have never heard of Postum and must say that the name would not have enticed me to try it. Did it taste like coffee or like cereal? I think it probably tastes something like coffee — that kind of burnt grain flavor — it smelled that way to me. But I don't know since I never drank it. I was interested, however, to learn that C.W. Post founded his Post Cereal company on the creation of Postum. Early TV jingles, by the way, were very effective. I still remember some from childhood (some time in the last century) including:Any kind of cereal is fine with me,As long as you spell it P-O-S-T,'Cause all Post cereals happen to be,Just a little bit better,(And much more wholesome)Than any other cereals happen to be.